The 100-day commercial whaling season is well under way in Iceland, but this could be the last year that the country's boats can hunt the great mammals of the sea. Officials in Brussels have warned the northern nation that if it wants to join the European Union it must give up whaling. Membership talks expected to last less than 18 months have begun, and EU negotiators have said that controversial areas such as whaling will be dealt with early on. At the Hvalur company's whaling station on the edge of Whale Fjord, north of Reykjavik, the plant's foreman Arni Hallgrimsson is worried. "I am pro-EU," he explained. "It is very important for Iceland to join the EU, but I believe whaling should be allowed. It's an animal in nature and why shouldn't we catch this one as any other?" But in the EU, all cetaceans - such as whales and dolphins - are protected by law. Although Iceland's application to join the EU was endorsed by MEPs in July, at the same time they called on Iceland to cease its long-standing tradition of whaling. 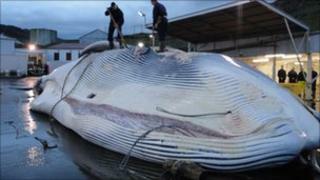 British MEP and European Parliament Vice-President Diana Wallis is in no doubt about the EU's stance on whaling. "Iceland's the strongest candidate we've had for EU membership in recent years. "But public opinion in Europe over the treatment of whales is quite high, so Europe will have great reservations about Iceland's commercial whaling. "I don't know if this will be a deal breaker, but it could be if we reach an impasse on both sides. But I hope there'll be more flexibility." At the Hvalur plant, fishermen have already caught 76 of the government-set quota of 150 fin whales, a species classed by other countries as endangered. The giant mammals - second only in size to blue whales - are processed in a courtyard known as the whaling deck. Within hours of being pulled ashore their flesh is stripped, blubber taken away, and oil extracted. As a team of 30 men work on the 40-tonne creature, a bitter, sour stench arises that assaults the nose and throat. Mr Hallgrimsson, the foreman, says there are no signs that they are "overdoing" whaling. "I hope that we can convince the EU that this is al right." Hvalur's owner Kristjan Loftsson is known as Iceland's "millionaire whaling king". He says he's not worried about the EU's call for a ban. The Icelandic people don't want to be told what to do. Why should we do like others tell us? "I am so over-confident that Iceland is not that stupid as to join the EU, that I'm not worried at all." The 67-year-old might have reason to feel secure. Opinion polls are now suggesting that a majority of Icelandic people oppose EU membership. Iceland is fiercely protective of its fish stocks and the country's Minister for Fisheries, Jon Bjarnason, has made it clear he will not back down easily over whaling. "Whaling is part of our existence. If the EU doesn't like our whaling, that is their decision." The minister went on to claim that Iceland's discussions with the EU are less of an application and more a testing of the waters to see what might be possible. He would not say if the continuation of whaling was a deal-breaker - but he said that interference in Iceland's fishing industry was, and that whaling was part of that. Whaling only fully resumed in Iceland last year after a 20-year period when the country did observe the international ban. The industry accounts for just 2% of the fishing income of Iceland, and most of the catch - fin and minke whales - is exported to Japan. In Reykjavik harbour boats leave all day to take tourists out whale watching. Those running these operations are amongst the minority here who oppose whaling. Rannveig Gretarsdottir manages the Elding whale-watching company. She says that the hunting of whales is harming her business. "My concern is also that it's cruel. Whilst mostly they kill the whales in the first shot, I've heard cases where it takes more. Once I heard they had to shoot a whale nine times. "And also there's no accurate way of recording the numbers of whales. There could be 20,000 fin whales off Iceland's coast, or only 3,000." She believes most Icelanders are indifferent towards whaling, rather than supportive. "Very few of us in Iceland even eat whales. Tourists do, but few Icelandic people." At the Reykjavik restaurant Thrir Frakkar chefs plate up more than 30 servings of whale a night. Some portions are served sushi style, others more like a beef steak. Polish visitor Lucas Paluchowski is one of the diners. "It was really soft, I would compare it to liver like we have in Poland. For me there is nothing wrong [with eating it]. When you visit a country you should try the specialities." Public opinion polls in Iceland consistently show little appetite for a new whaling ban in the country, so the leverage of EU membership talks represents a rare chance for the international community to secure a cessation of whaling. But for that to happen Iceland must want to join. Whale-watcher Rannveig Gretarsdottir might not agree with Kristjan Loftsson on many things, but she concedes he has a point about Iceland's attitude towards the EU. "The Icelandic people don't want to be told what to do. Why should we do like others tell us? Until now we've been independent, and we don't want others to tell us what to do." Iceland has always been a fiercely independent nation, and therefore supporters and opponents of whaling alike might yet reject EU membership simply because they do not like being dictated to from abroad. With such a rejection, any leverage the EU has to secure a whaling ban would therefore be lost. You can listen to Matt Cole's report on The World Tonight on Radio 4 at 22:00BST.